I missed October's months budget because of my parent's visit, first of all because they were here during the end of October and the beginning of November, and also because their visit kind of screwed up those two months' budgets. We were recording costs before and after their visit, but we totally stopped while they were with us as we were spending a lot more money than we would if we were alone, particularly on alcohol and eating out, but also somewhat on groceries. Another reason is they kindly paid for all those extra expenses. Anyway, here is both October and November's cruising expenses. It's not 100% accurate, but I still think it's a pretty reasonable reality of what we spent, if we had just been the two of us alone. Overall the countries have been pretty cheap for cruising, although food (besides fruit, veggies and a few staples) is still more expensive than NZ, but then it's also quite limited what you can buy in the first place. 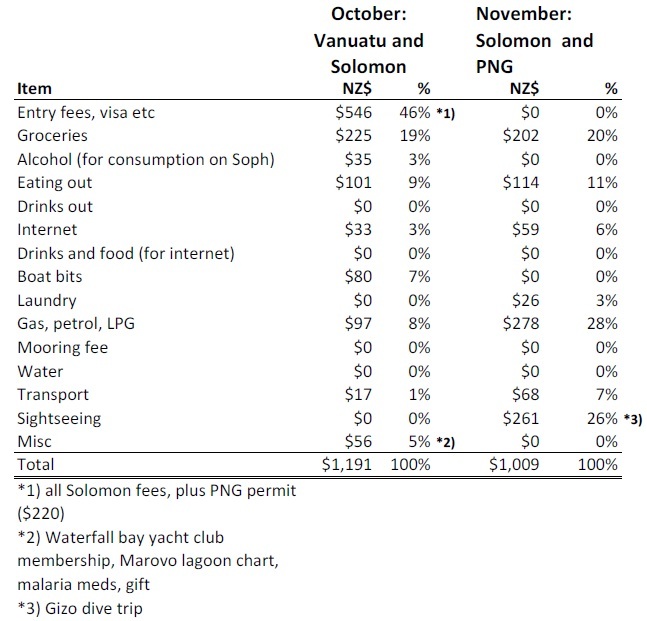 Solomon Islands is quite expensive for clearing in and out of though. Interesting is also we haven't spent anything on mooring fees (haven't been any) or water (we have almost exclusively caught it all with our rain catchers). Drinks out has pretty much merged into eating out, I may delete it next month if we don't start going out drinking a lot. It's also mostly a night activity and we have spent pretty much all nights on Sophia for security reasons.